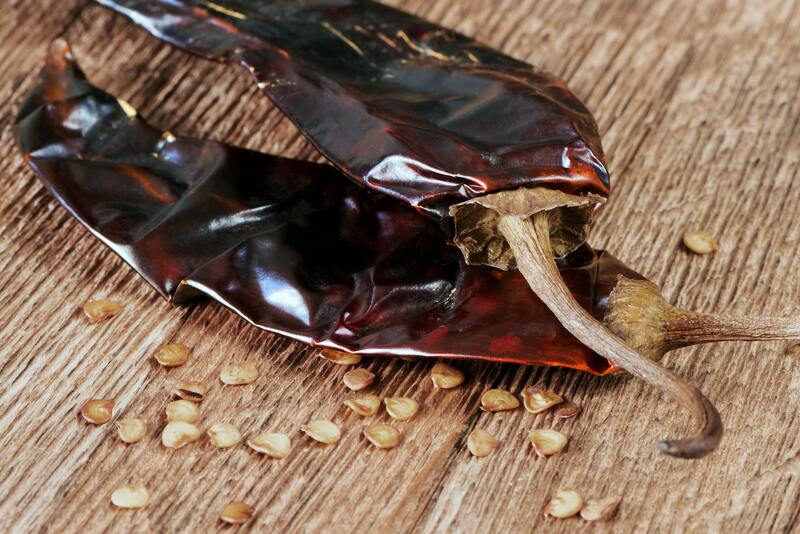 You are here: Home / Bring the Heat Blog / What’s A Good Pasilla Pepper Substitute? 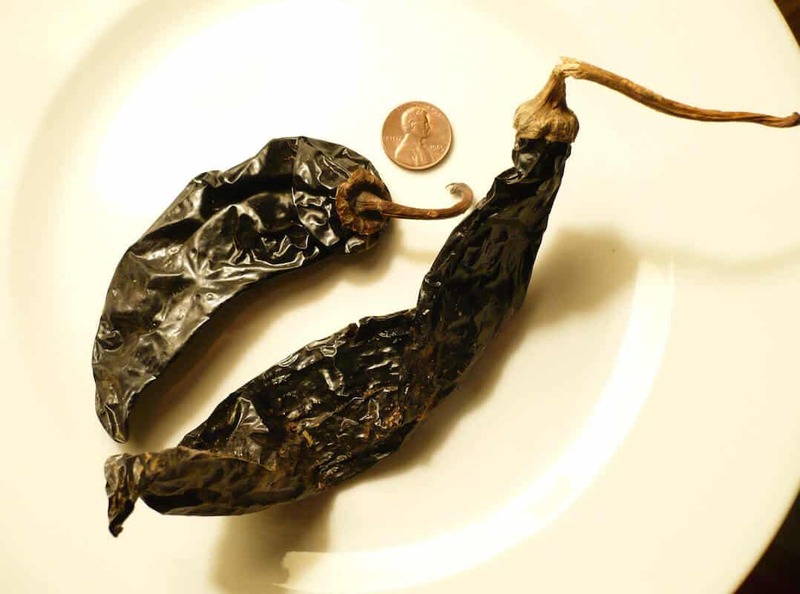 Pasilla peppers are one of the “holy trinity” of Mexican mole chilies, so – with the rise in popularity of authentic Mexican cuisine – the pasilla’s popularity is also rising around the world. But, depending on where you live, they can be tough to find. So what are your options if this chili isn’t at hand? What’s a good pasilla pepper substitute that’ll work? The good news is that you can turn to the other members of the holy trinity of chilies, but each has its own unique flavor profile and heat considerations, so consider carefully when subbing into recipes. 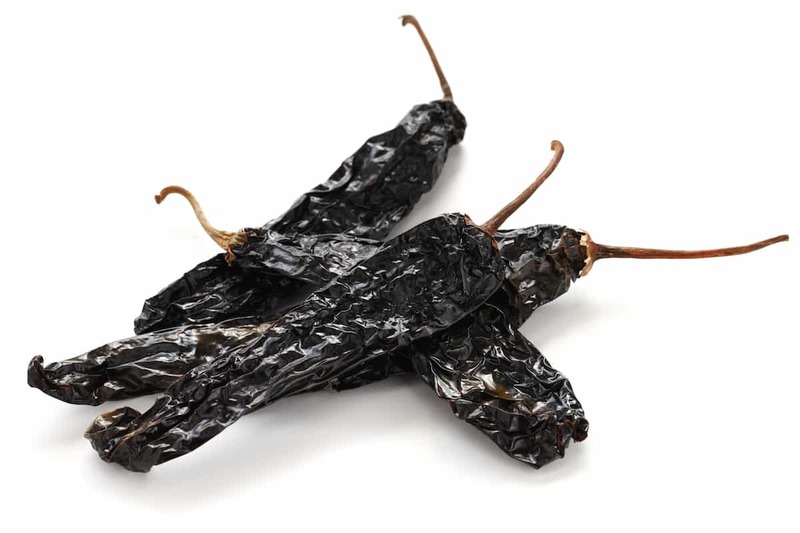 Ancho chilies are far and away the most popular of the three dried chilies that make up the Mexican chili holy trinity. You can find them at specialty shops, and many supermarkets now carry these dried chilies. In terms of heat, the pasilla (1,000 – 2,500 Scoville heat units) and the ancho (1,000 to 1,500 SHU) are close. They are both mild chilies, with the pasilla having the potential to reach near mild jalapeño heat. Overall it’s a small sizzle bump that most won’t notice. Considering flavor: Both are earthy with the ancho being slightly fruitier and sweeter and the pasilla having a little more of a raisin and cocoa undertone. There is a difference, and depending on your recipe (and how authentic you want it), this could affect the taste. Still – if you are going to substitute in any one dried chili, it’s to the ancho you turn. Mulato peppers are close cousins to the ancho – both being dried poblano peppers, just two different varieties. They have a slight heat bump over the ancho (2,500 to 3,000 SHU) which places them at the lower-end of medium hot chilies. The mulato’s flavor is earthy, too, but a bit smokier with a hint of chocolate. That cocoa undertone may make the difference to your recipe, so if you have mulato peppers available and you are good with the additional spiciness, then give these peppers a go. The third member of the Mexican holy trinity, the guajillo pepper turns up the temp on any meal with a Scoville heat range from 2,500 to 5,000 SHU. They are often as hot as most jalapeño peppers you find. It, too has an earthy flavor, with hints of tea and cranberry. It has a pungent sweetness that some people love, but depending on your recipe may be too much as a pasilla alternative. What's A Good Guajillo Pepper Substitute?